SmarteLoad simplifies web performance and load testing, and is used for performance measurement, load and stress testing and reliability validation. SmarteLoad presents test results in a user friendly format, creating customizable charts and graphs that can be exported to many formats, including Microsoft Word, Excel, and HTML. SmarteLoad can leverage already existing automated functional tests to give you a jump start on your performance testing project. You will spend less time designing and more time executing performance and load tests. Only SmarteSoft delivers an integrated environment where a single set of test scripts is all that is required for each step of the test process. In a standalone environment SmarteLoad automatically generates tests scripts and is completely self-sufficient. 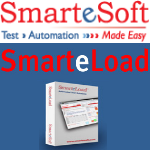 Seamless Integration - SmarteLoad easily transitions and streamlines functional, performance and load testing with SmarteScript and other functional testing tools. SmarteLoad scripts can be generated by executing existing SmarteScript scripts or other functional testing tools that play back on Internet Explorer, Firefox or Chrome browser (for example, WinRunner, QTP or other tools). Grid Visualization System - During recording or script importing, SmarteLoad automatically creates a data grid which tracks and drives the test case flow. The grid contains static and dynamic data variables, data types as well as URLs, headers, forms and the type of actions to perform. Automated Multi-level Grid-driven Testing - No programming is required. SmarteLoad is the industry’s first fully integrated tool. SmarteLoad parametizes and automatically correlates dynamic data and parameters received from servers upon client requests. Correlation of dynamic data is the industry’s most difficult, complex, and tedious tasks in load testing. User can undo specific or all correlation with a click of a button. Use of SyncPoints - Transaction measurements and SyncPoints are added within the synopsis with a mouse click and are viewable at any time in the Synopsis grid. Remote Server/Agent Installation - SmarteLoad is the industry’s first load testing tool that enables remote Host Generator Agent recognition, connection and remote agent installation on servers and hosts. The Host Management tool empowers users to easily and rapidly configure the testing environment without the need for manual installation or involving system administrators in this process. Recording and Protocol Support - SGM is able to record HTTP/HTTPS traffic from any application, including Internet Explorer, Chrome, or Java applications. SmarteLoad also supports automatic decoding of Java Object Stream data. Scripting, Debugging and Logging - SmarteLoad scripting is highly flexible. Playback logic and correlation algorithms can be changed by users. This means SmarteLoad can be customized to address unique customer needs, without waiting for a new software build. Detailed Logging mechanism - After execution of a synopsis in the Controller, you can analyze request-responses of any action for any SimUser. Add Compound Dynamic Variables - Each type of dynamic variable has it’s own view. Some examples: compound variable view, Left Boundary Right Boundary (LBRB) dynamic variable view, and RegExp dynamic variable view. Compound Variable Syntax - Compound variable can use data and dynamic variables and escaped text. Choose from a variety of methods to access data variables including first, next, random. Compound Variables in Headers - Each header name or value is treated as a compound variable so all compound variable rules will apply to the header name and header value. Random Fixed or Different - You can alter SmarteLoad Default Settings to select Fixed order (the same each time the script is launched) or Randomized. Fixed order is recommended to run regression tests for SGM. All as Compound Variable - All action data (url, headers, post data) is contained in one compound variable. All known variables from post data are in action vars grid. Double click on the variable value to change it value. Dynamic and data variable types are special cases of Compound type. Compound Variables Calculation Order - All Compound Variables are calculated before each action starts in the order in the Dynamic Variables dialog list. Compare Files with Different Application - Use the ‘Write Files For External Compare’ option: if set to ‘True’ – SGM will sort files after record and execution to a special folder. SGM attempts to sort files with logic during record. If the user changes the logic after record, the execution logic structure will differ from the recording version. Dynamic Variables Import/Export - Your can save dynamic variables to disk for further use in other scripts. Export writes all dynamic variables in a list to a file. Import will read all variables from the file and append to existing variables. This function is useful when creating sets of scripts using the same variable data. Testing Webservices - The webservice can be called up via XML with a Soap envelop (and header created by the user) over HTTP, bypassing the Soap and webservices protocols by using an XML envelope to send the webservice request which runs on HTTP. Performance Testing - Ability to cope with load and stress under any scenario. GUI usability - user-friendly GUI, uses a navigate-and-record methodology to automatically create a data grid that drives and tracks the test case flow. The grid contains static and dynamic data variables and data types, as well as URLs, headers, forms and the type of actions to perform. Extensible and Flexible - Leverages Java Protocol for maximum platform extensibility. It’s easy to add custom protocols or integrate existing Java servlet libraries via SmarteLoad’s open API. Remote host Generator Agent recognition, connection and remote agent installation on servers and hosts. Performance is tracked while simulating actual scenarios and measuring real-time transaction response time. Create custom charts and graphs. Host Management utility - embedded in the Controller. Analysis and Report components - embedded in the Controller. SGM (Script Generation Module) - single license. Host Management Agent installation for local and remote Host machines. SmarteLoad setup uses Microsoft Installer, so, installation process is simple and clear. Ensure you are launching SmarteLoad Setup.exe as an Administrator. During installation you are able to choose which feature (Controller, SGM, Agent) will be installed.